Hi friends! I hope you're having a great day! I'm doing good. Yesterday was the first day I felt fully better since I got sick last Sunday. It was brutal. I think it would have been much much worse had I not had a flu shot. It felt like a flu but not as severe. Avery on the other hand isn't get better. Mostly because she's being a stinker about her medicine. She spits it right back out. Every. Single. Time. I have no idea what to do. Today, I'm sharing a card I made for the Stampendous Jan 2014 Challenge which is to interpret your New Year's resolution onto a card. Well, I don't do resolutions but I do One Little Word. My OLW for this year is Accomplish and part of that is blogging and creating more. I pulled out the one Stampendous stamp I have and got to work. If you've been around my blog for a long time, you know that I used to do some vintage cards. I'm a bit rusty, not gonna lie. But if I don't practice, it won't come back. I used some Crate Paper Maggie Holmes paper and ephemera. I used mist on the image, a doily, lace tape, and some sequins. The sentiment is a stamp from Flourishes. Ooo vintage...I do love to drool over vintage cards...it's the one style I have the hardest time with! Glad you're feeling better. Hoping Avery's immune system will kick in! Have a great week! This is really cool! 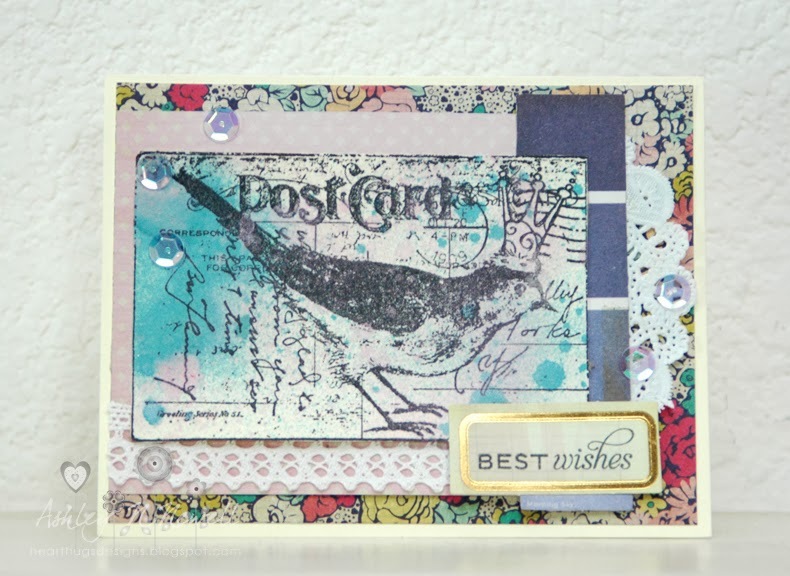 Love the paper you chose to stamp on, and the sequins, wonderful layers! This is awesome, Ashley! Thanks so much for entering our Challenge!! Love your addition of the sequins and lace...so feminine and some really fun pop with the gold rimmed greeting!